Include; restlessness, fatigue, pain feeling of tingling, burning, throbbing or heaviness in the legs. The most common causes for this condition are heredity, occupation, long standing hours, obesity, constipation, use of birth pills & hormonal changes in the body during pregnancy, puberty & menopause. It is a natural body cleansing product & also improves blood flow & circulation. Apply undiluted ACV on the skin over the varicose veins & gently massage the area. Do it everyday before going bed & again in the morning. Follow it for few months to reduce the size of varicose veins. Add 2 tsp. of ACV in a glass of water & stir well. Drink the mixture twice a day for at least a month to see positive results. It is very necessary in treating varicose veins is increasing the blood circulation & with that reducing pain & inflammation. Mix equal amount of coconut oil/olive oil + Vitamin E oil & warm up slightly. Massage with this for several minutes. Do it twice daily for 1-2 months. You can mix four drops of essential oil in 2 tsp of warm coconut oil & massage with this mix. It is a natural blood thinner, anti-inflammatory, also helps to breakup harmful toxins in the blood vessels & improve circulation. Slice up 6 garlic cloves & put them in a clean glass jar. Extract the juice from 3 oranges & add it to the jar along with 2 tablespoon of coconut oil. Let it stand for about 12 hours. Shake the jar & then put a few drops of the solution on your fingers & massage the inflamed veins with it , in a circular motion for 15 minutes. Wrap the area with a cotton cloth & leave it on overnight. Repeat daily for several months. Rich in vitamin c & bio-flavonoids, it increases blood circulation & eases the pain of congested, swollen veins.It protect the walls of the blood vessels from free radical damage & promote collagen formation to keep them healthy & elastic. Also Capsaicin has anti-inflammatory, Analgesic& blood thinning properties. Add 1 tsp of cayenne pepper powder to a cup of hot water & stir well. Drink this mixture 3 times a day for 1-2 months. Take few GREEN TOMATOES, clean them & cut them in thick pieces. apply them on the varicose vein area & put a cloth over them. Tie the cloth so the slices don't fall off. Leave them on the affected area until you feel tingling. As tomatoes contains an ASPIRIN-like substance & also it is an anti-coagulant which dilutes blood. 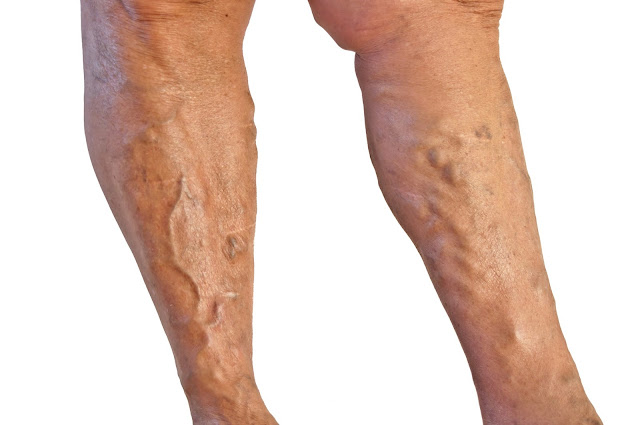 Applying a mudpack to varicose affected legs may help reduce vein enlargement. It helps to reduce pain also. Fine clay such as FULLER"S EARTH is best for mudpack. Mix the clay with water & apply to your legs before going to bed. Morning wash the clay with warm water & pat the area dry. As the clay dries, it contracts, resulting in a tightening effect. It works in a similar fashion to compression stockings by constricting the dilated blood vessels & promoting blood flow. Clay has a detoxifying effect too. It draws out impurities from the skin & the blood vessels. Applying uniform pressure on the legs with specially designed compression stockings is a tried & tested remedy for varicose veins. Loss of elasticity of the blood vessels & their consequent enlargement reduces the efficiency of the venous valves trying to stem the back-flow of blood. The gentle, yet consistent pressure compresses the veins, reducing their diameter. This helps the valves to work more effectively to prevent the back-flow. The additional support for the venous walls facilitates the smooth flow of blood, reducing the risk of stagnation & blood clot formation. Research indicates that an increase in homocysteine levels in the blood can damage the lining of the blood vessels & increase the risk of thrombosis & varicose veins. Deficiency of B-complex Vitamins, B 6 (Pyridoxine), B9 ( Folic Acid )& B12 (Cobalamine) in particular, is known to elevate homocysetene levels. Include Tuna, Salmon, Shrimp, Chicken, Turkey, & eggs . Also vegan sources like Sweet Potato, Potatoes, Sunflower Seeds, Avocados, Bananas, Broccoli, Lentils & Lima beans. Include Anti-inflammatory foods like oily fish, Green leafy Vegetables, Beets, Tomatoes, Nuts, Whole Grains, Ginger Turmeric, Garlic, Onion, Berries & Cherries To reduce Pain & Swelling. The heart pumps blood into the arteries, but its return to the heart from the legs is aided by the movement of the calf muscles. That is why sedentary lifestyles are bad for varicose veins. Walking is a good activity since it boosts blood circulation, even though the veins in the legs have to carry the blood upwards against gravity. Tiny seeds inside grapes contain antioxidant substances, flavonoids, linoleic acid & Vitamin E. It also promotes the formation of collagen, a protein that helps maintain the elasticity of connective tissues & strengthen the walls of the blood vessels. It prevents leakage of fluid from the veins & resultants swelling of the legs.